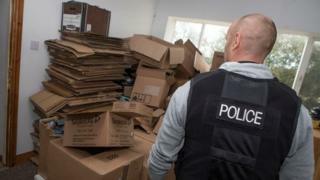 Six men have been arrested after prescription drugs worth several million pounds were seized during raids in Greater Manchester. Officers searching properties in Bury, Tameside and Cheetham Hill as part of an international fraud operation found the drugs on Tuesday. The men, aged between 18 and 54, were held on suspicion of supplying class C drugs and remain in custody. Police said prescription drugs are often sold illegally online. Det Ch Insp Charlotte Cadden said officers had spent months on Operation Pyarr, which aims to identify "where the public are able to get hold of these controlled drugs". The Medicine and Healthcare products Regulatory Authority is running the investigation in conjunction with Greater Manchester Police and the Police Service of Northern Ireland.